Not only was she the youngest woman (and first Jew) elected to Arizona senate (at age 30), she is also a huge pro-biking advocate. Our thoughts go out to Gabrille and her family in her recovery!! DC.StreetsBlog post on Rep. Gabrielle Giffords’ cycling advocacy. 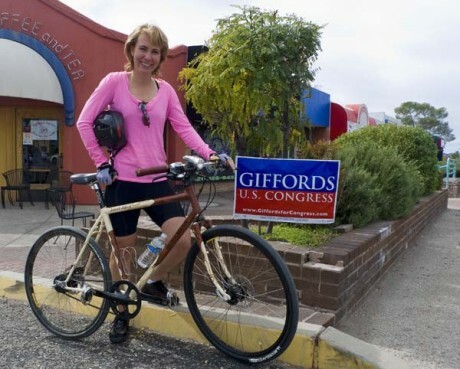 Giffords herself rides a custom-made bike with her name in western-style rope on the top tube and an Arizona flag. A member of the Congressional Bike Caucus, she bike commutes to the Capitol from her home in Washington.